Age of Ultron Companion Average 0.00/5 - out of 0 total votes. Collects Avengers Assemble #14AU-15AU, Fantastic Four (2012) #5AU, Superior Spider-Man #6AU, Ultron #1AU, Wolverine and the X-Men #27AU, Uncanny Avengers #8AU, Fearless Defenders #4AU & Age of Ultron #10AI. As Ultron's onslaught continues across the planet, Black Widow pays a high price in San Francisco and Captain Marvel joins Captain Britain in a fight to save London! The Fantastic Four return from a jaunt across time and space in a futile bid to save their homeworld! Otto Octavius, the Superior Spider-Man, believes it will be simple to vanquish an A.I. threat...but his vanity will prove his undoing! 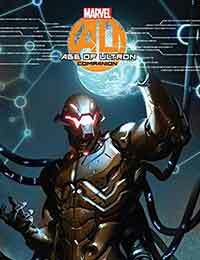 And in Los Angeles, Ultron's "son," the android Runaway Victor Mancha, battles to prove he is nothing like his "father." Ultron's attack batters the Fearless Defenders, Uncanny Avengers, Wolverine and more...and in the aftermath, witness a dramatic change for founding Avenger Hank Pym!